Welcome to Bee Line Art Tools! We are excited to announce a brand new product! Check it out here! Quality, precision engineering and care go into all of our products made right here at Bee Line Art Tools in Bettendorf, Iowa. We pride ourselves in the exquisite craftsmanship of our premier Bee Line products, making your wool cutting go smooth, quick, and seamless. You will be pleasantly surprised at the ease and time-savings of switching cassettes to cut your perfectly sized strips for your next adventure in rug hooking! 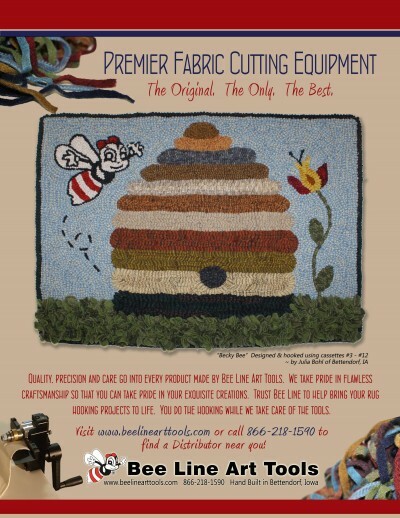 Please contact one of our distributors or order directly online, and we will get you all set up with your favorite Bee Line products and make your next project with the top-of-the line in rug hooking equipment! You deserve it! Don’t forget to send in your photos for our Gallery page! We would love to share your artwork with others to inspire rug hooking around the world! Please send via e-mail to smccammon@beeline-co.com. Best wishes from our hive to yours!